On 8 September 1943, the day of the feast of the Nativity of the Theotokos, the Italians capitulated and in the beginning refused to surrender their weapons to their German allies. In Orchomenos of Boetia the regional organization E.A.M. felt they could capitalize on this and accept the Italian arms. The Italians refused this and went with their weapons to Livadia. 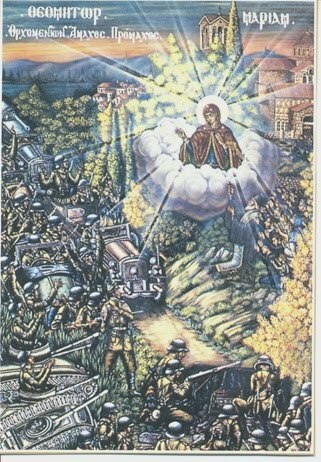 On the way the Germans surrounded them and disarmed them, and the Italians betrayed the people of Orchomenos by stating their intentions. When the Germans learned of the intentions of the people of Orchomenos they sent against them the next day, September 9th, armored vehicles. 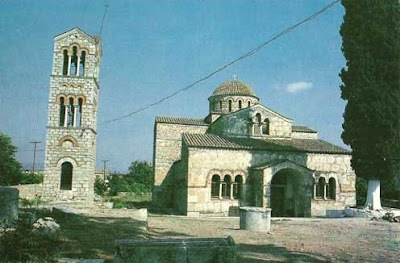 When the people of Orchomenos heard this they left and arrived at the crossroads of Agios Andreas, unprepared and disorganized as they were, and scattered throughout the surrounding area to the most remote Dionysus (Tsamaliou). The Germans continued the chase, to retaliate against Orchomenos, as was their usual tactic. When the Germans entered Orchomenos they took 600 hostages, left a section in the village, and sent three tanks against the rest to Dionysus. On the night of the 9th towards the 10th of September, at around midnight, about 550 meters away from the Byzantine Church of the Panagia Skripou (established in 874 AD), the three German tanks were immobilized for no apparent reason. As the German commander known as Hoffman later recounted, the form of a woman had appeared in the night sky with her hand raised in a prohibitive stance. Commander Hoffman then requested a tractor to pull the tanks, and he beheld another miracle when the tractor was able to easily pull the heavy tanks like an empty matchbox. He then proclaimed "miracle! miracle!" and asked the residents to take him into the church. 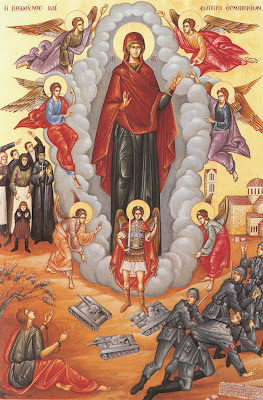 From the icon in the church the commander recognized the woman to be the Virgin Mary. He fell down on his knees and said: "This woman saved you! You must honor her and glorify her!" Orchomenos was indeed saved by the Panagia and the 600 hostages were freed with a vow by the commander that the village would not be harmed. 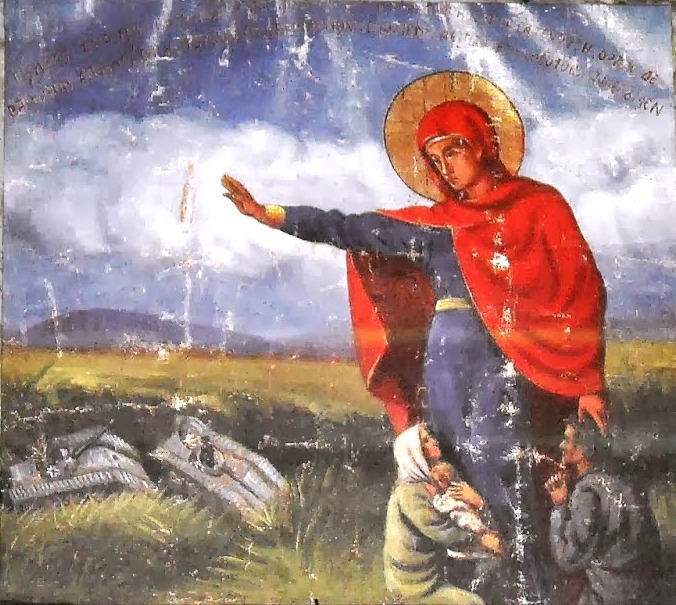 Following the war, Commander Hoffman returned to the Church of Panagia Skripou, donating an icon of the vision he saw along with an large oil lamp. Just about every year he returned on September 10th to commemorate the event and light a candle in the church. 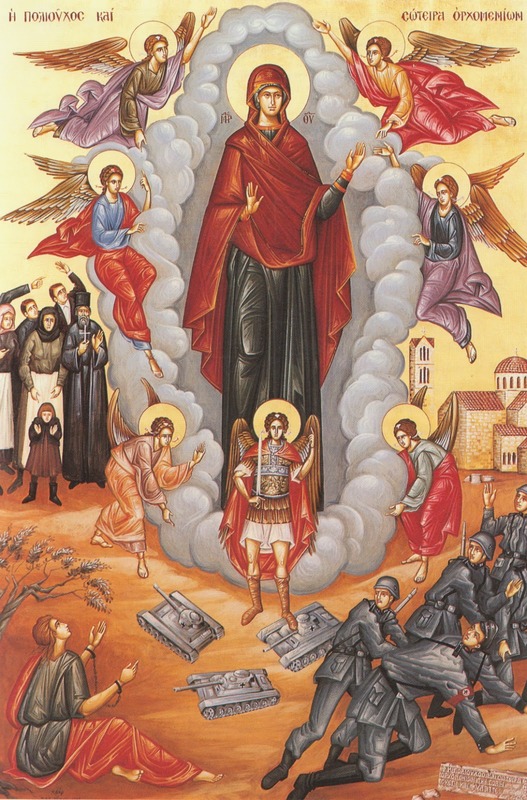 For this reason the Panagia Skripou celebrates a feast on September 10th every year. 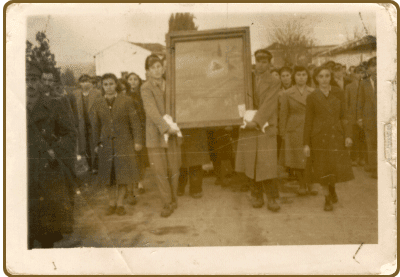 A procession takes place with the icon on this day to the spot where the tanks were immobilized.